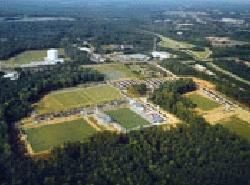 SAS Soccer Park, a 150-acre multi-use complex operated by the Town of Cary. The park hosts professional matches, college and high school tournaments and other events. Fields are available (by reservation only) for low impact field sports such as soccer, youth football, lacrosse and ultimate Frisbee. The park also includes a world-class cross country course that encircles the park. Hours of Operation: To reserve a field or get more information about park events, call or visit weekdays between 8 a.m. and 5 p.m.